Crowdsourcing endangered languages is one way to preserve languages in peril of disappearing. Biagio Arobba’s website LiveAndTell, for instance, uses a social media interface to archive Native American languages. Still, other methods have recently been developed to catalogue and disseminate endangered tongues. Spearheaded by Laura Welcher, the Rosetta Project is a product of The Long Now Foundation, “a foundation created to encourage clock and library projects. (Other Long Now projects include the building of a 10,000 year clock in a mountain in Texas and Long Bets, “an arena for accountable predictions.”) While LiveAndTell offers an interactive and accessible means of preserving and using an archive, the Rosetta Project swings to the other side of the spectrum: the long term archive. 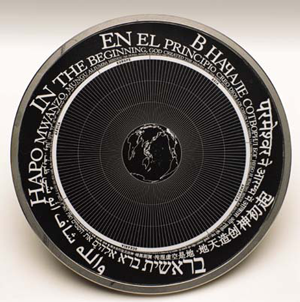 Since developing the prototype, the Project has gone on to etch sets of parallel documents in over 1,000 human languages with the belief that by recording all languages, they have provided a key to deciphering any language in the future (much like the Rosetta Stone was the key to the Egyptian hieroglyphics). Today, they have inscribed over 2,500 languages and the project has expanded to an internet archive. Open-access, the archive can be used by anyone with access to the internet. All this said, the project is still growing and one key event was the recent Rosetta Project event in San Francisco. Over 100 educational and cultural organizations were invited to attend, and “the organizers [were] hoping to capture 50 different languages during this ‘record-a-thon‘ with webcams and cellphone cameras and in a studio.” With over one hundred languages represented in the Bay area, the location was undoubtedly a good place to start. While Welcher and the Rosetta Project’s goal is wider in scope than Arobba’s crowdsourced LiveAndTell, it’s easy to compare and contrast the two in an attempt to find the “better” solution. Arobba criticized the Rosetta Project for being too static, for not responding to speakers and learners soon enough – indeed, it does take time for the project to record, etch, and archive new language material. On the other hand, the Rosetta Project addresses the need for a research-backed archive of the world’s languages. LiveAndTell, while easy-to-use and instantaneous, is self-editing, like Wikipedia. Its users must patrol the accuracy of new words or phrases logged on the site. Essentially, the two projects focus on different needs and different approaches for language conservation. One is for the public, the other is for researchers or those in academia. It remains difficult to argue which, if any, is truly better than the other. In the end, languages and dialects continue to be recorded – and that is always a good thing. Photograph of the Rosetta Disk’s face. See more images at the Rosetta Project website. Thoughtful write-up, thanks for posting! Live and Tell is a cool project, and definitely on my radar.